I just finished watching 13 Hours. I’m still in awe and speechless with what these men and women do for us day in and day out. I shouldn’t have to give us all a reality check about how lucky and blessed we are to live in America. Not to mention, having these hero’s and people willing die for us when we have no idea what is going on. Here I am on a Saturday night; I can give up two hours of my easy life and safe life to watch a movie. Nobody made me do it; I choose to do it because I wasn’t feeling good and have a sore throat and didn’t feel like working on my website at the moment. I was using that as an excuse and yes that excuse won. You know what; I didn’t care about my website in that moment. Here I am sitting in my room next to my comfy bed, listening to peaceful music as I write this post. 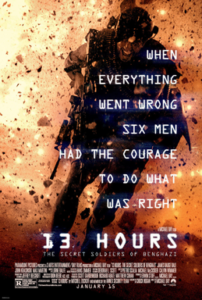 Again if you don’t know what I’m getting at, watch 13 Hours. Go watch ANY military movie or read a book. Then maybe you will understand what I’m talking about. I’ll admit I get caught up in my own issues. Trying to work on my website build that up and share my story with you. Trying to place the finishing details on my book and hopefully publish it by the end of the year. My other jobs are working for my dad part time, and not to mention my regular job at my gym. Yes, I’m busy I won’t deny that. The difference is I choose to do all of this and I’m able to do all of this every day. Yes, it’s frustrating and stressful at the moment, I won’t lie. That’s probably part of the reason why I’m getting sick. You know what; it was a reality check I needed to have. I didn’t want to watch the movie that much because I have seen it before and heard the story. I said I’ll watch for a few minutes then go back to work. After five minutes, I knew I wasn’t going anywhere. It might sound stupid and funny. Again, If I can’t give up two hours of my FREE time to watch this movie and witness the sacrifices that they give every day. How selfish am I? I’m guilty of that I won’t lie I get distracted living in my life and thinking my goals our more important than others sometimes. I’ll admit it; I’m not saying they are better than anyone else or I’m more important than anyone else. In all reality compared to these people that fight for us every day. Going to places and countries that hate Americans and fighting for YOU and ME. I’m a nobody, compared to them. I don’t deserve to be on the same level with them, with all of the sacrifices they give. That might sound harsh but I don’t care, this is my post. If you don’t like it then you can stop reading. We need to start treating the people that protect us every day better, it’s that simple. It shouldn’t be that hard and complicated. That could be donating money, time, or helping out families that have loved ones fighting for us. Even go as far as saying thank you if you see someone in the military walking by. If you don’t have the time or spare money at the moment then simply say thanks, it’s better than nothing. I’m not perfect I have missed out on a lot of opportunities thanking people that are in the military that fight for us. I use the excuse I’m busy or they look busy. I don’t want to interrupt them or whatever the reason is. That’s just stupid and I know I’m wrong for thinking that, I’ll admit it. That’s why I need to change; this reality check goes beyond just posting on my blog and website. Yes, my message that I’m trying to share with kids and young adults is to keep going and fighting. Just like the men and women in 13 hours. Now please don’t misinterpret that statement, my battle is not anywhere close to the battle they were fighting. That’s not what I’m saying please, don’t twist my words. All I’m trying to say is we all are fighting our own battles every day. How we choose to respond to those battles and issues that are coming our way, is how we figure out what we’re made of? Again my battle realistically is nothing compared to a military battle. We’re all trying to find our own way and our own path here in life. We all take different paths and roads every day. Once again that’s what makes all of us unique and special. How are you going to respond to those battles and roadblocks standing in front of you? I’m not going to let a stupid simple sore throat keep me down. Or the fact that I’m working three plus jobs at the moment hold me back from chasing a dream. That’s only going to keep me going. All the stuff I’m trying to do on the side is funding this little project of mine I’m trying to turn into a permanent gig. Now I’m not trying to make anyone feel bad about how lucky they have it or anything like that. Actually no I am going to make you feel bad. I needed a reality check and so do you. Start giving back and playing your part in the world, it’s time for us all to make a change. Before you say something to think you have it worse than everyone else. Think to yourself real quick tonight before you go to bed. Is anyone else shooting at you, do you have a comfy bed to sleep in? What’s it like to walk around in your own home with your family? It’s not a bad thing to think before you speak sometimes. Be grateful for what you have. Because so many people probably have it worse than you?